If you go dancing on a regular basis or need shirt for a tuxedo that isn't your basic wingtip style, try some of these great looking satin dress shirts by Daniel Ellissa. 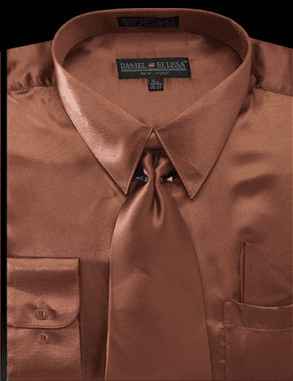 These copper brown color satin shirts feature a classic fit with the matching brown color tie and hanky set ensuring that you will dressed to kill. Try not to hurt anyone. You can also make group orders for these shirts for either a theater production group or Church group. Hook up your satin shirt with a nice Tuxedo also. Have you bought any new Mens Suits lately. Remember that you'll need some new Stacy Adams Shoes to finish your look.